Everything I wanted but only one of it at a time. This was the deck I've been waiting for. I love Magi and I've been eager for this deck to show up at my door since the moment it was announced. It is also the first deck where I've been excited by all three characters and wanted to use them all. Unfortunately, that isn't possible. Why? Because they all three use Magus Arcana as a Cohort and there is only one copy in the box! I've been daydreaming about the moment when I finally get to send Zvarbel and Talitha off onto an Adventure Path together but I guess that's not going to happen. All the cards are really solid and thematically appropriate and there are some reprints it will be really nice to have an extra copy of. Just really needed those extra Magus Arcana for it to be what I wanted. Now available for preorder! Image and description are not final and may vary before release! Wuuuuuuuut?? Yessssss. Class decks are back! Ooh - is this the Gencon release? That looks interesting! I may finally have a reason to get into this game. I was waiting for the Magus. i thought id ask everyone this i just preorded this deckm the base game is rise of the rune lords right? same thing with shackles of the mummy etc the adventure packs 1 of 6 stuff like t hat i sthat included in the base game or are those add ons to the base game? The Magus deck can be used with any of the base sets (Rise of the Runelords, Skull and Shackles, Wrath of the Righteous, or Mummy's Mask). It will include three new characters for the game and a bunch of boons that will generally highlight the strengths of the three characters that come in the box. You can also use this deck for organized play scenarios in Season of the Shackles, Season of the Righteous, Season of the Runelords, Season of the Goblin, or Season of Plundered Tombs. 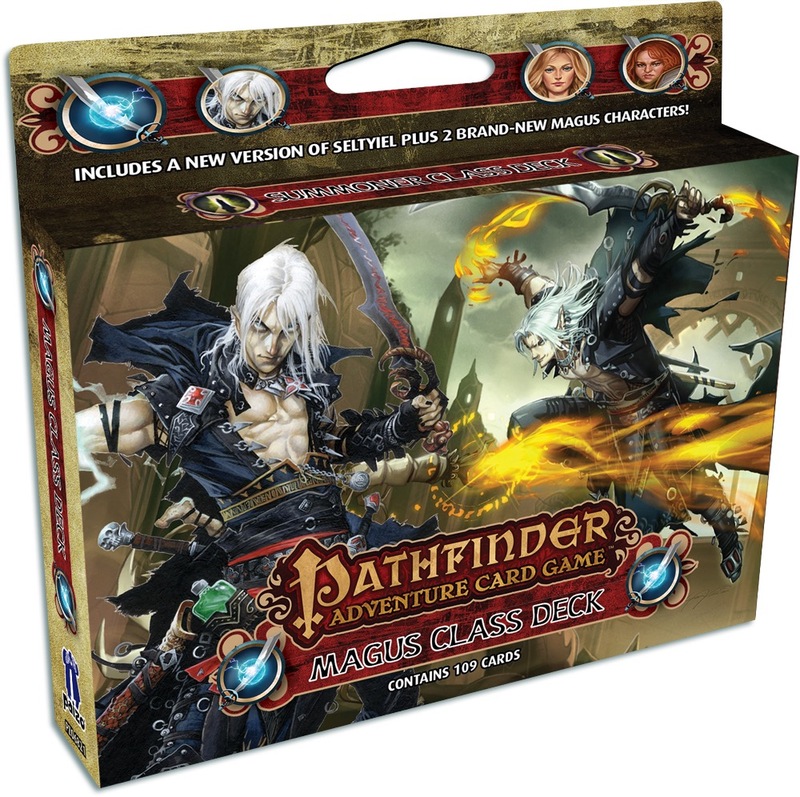 In the case of organized play, you can build your deck ONLY with cards that come in the Magus class deck, and upgrading works differently, as explained in the Pathfinder Adventure Card Guild rulebook. so rise skull and wrath and mummy are all diff base sets right? 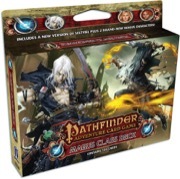 only thing that change from base set to base set is character decks? The base sets are self contained. Each base set has 7 characters and can be extended by 4 more by using the appropriate Character Add-On Deck. Class Decks are different. They contain three thematically connected characters each and can be used to add more characters to a base set, or to play Card Guild Organized Play scenarios. You do not need class decks to play the game with a base set. c. A new version of the Iconic Magus and two all-new characters? The correct answer is "C". In addition to a new take on Seltyiel, we're introducing PACG's first angelkin (you might call her an aasimar), alongside a character that has appeared twice in the RPG line. Any idea when we'll be able to register Magus characters for Organized Play? It's not a listed option on the registration page. Shortly before the product's official release date, August 17. Following up on Abyssalstalker's question from two weeks ago. I'd like to play the characters I purchased. When will the Class Deck PDFs be updated? Still looking for the PDFs for the Magus deck. Any idea when they will be posted? Some explanation from Vic is here. Is there a Card List for this deck?